Oh December 2018, I can’t say I’m going to miss you. Sure, you brought some fun memories, like Vancouver and the holidays, but man has it been a rough ride, especially for our family. Two and a half weeks ago Kaiden had a fever which lasted over 6 days and morphed into an ear infection. I was in Vancouver for most of that time, but my sister, Vishnu and dad were around Kaiden quite a bit. And all three of them caught whatever he had. Think cold + cough + fever. Fast forward to the following week. Everyone was still sick (minus K), and now Adarsh (my BIL) wasn’t feeling too great. I was the last man standing at this point and so thankful for it. Fast forward again to this past Thursday. The day Kaiden and I left for Atlanta. Kaiden woke up at 6:30 am, which was such a pleasant surprise. I went in to pick him up and noticed his pajamas felt a little damp and crusty. I immediately thought he had diarrhea and woke Vishnu up so we could manage the situation. Vishnu went in to K’s room and yelled out that he had vomited and that we needed to give him a bath immediately. So we did all that and everything seemed ok.
Then right before we were heading out for the airport, Adarsh was getting K ready (putting his socks, shoes, and jacket on) when he vomited again all over our couch. Again, we cleaned everything and everyone up and headed out the door. I prayed all the way to the airport that Kaiden wouldn’t get sick on the plane, and thankfully he didn’t. In fact, he slept for most of the flight. Everything was fine until the next day. And then K had diarrhea. Because we’re experienced with stomach bugs, I did my very best with hand washing and sanitizing. I did not want to catch whatever he had. I told my parents to do the same as well. Well, no dice because I experienced the same symptoms starting Friday night well into Saturday morning. And. It. Was. Miserable. I felt ok Saturday evening, and Kaiden seemed to be on the mend too, so we thought all was good. Kaiden feeling good enough to roll around and make a mess while the rest of us stuffer…lol! Again, no dice. My mom felt sick Saturday night and went through exactly what I did well into Sunday. Here’s the kicker. My poor dad, who already got sick in Chicago, got sick again last night with the same symptoms as my mom and I.
I’m hoping we get better before we head to my in-laws’ house on Friday. Fingers and toes crossed! And that’s why I, along with the rest of my family, am ready to say goodbye to December 2018. I can’t even believe it! The trip we’d been looking forward to and planning for months is behind us. 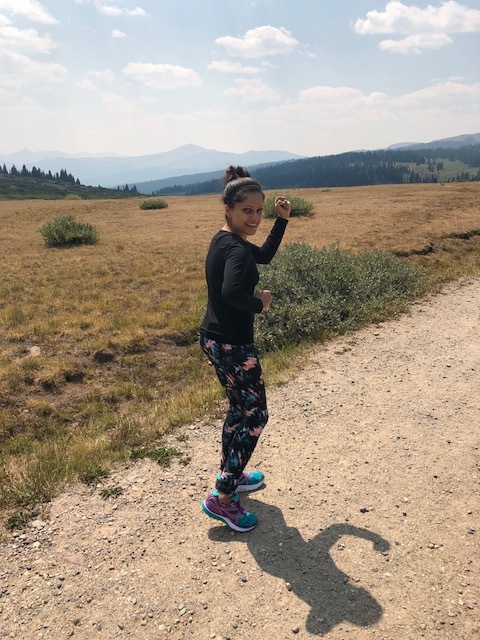 Vishnu’s cousin got married in Vail, Colorado this past week, and instead of just going for the wedding, we (V, K, me, my MIL, FIL, and BIL) decided to add a couple of days to the front end and make a mini vacay out of it. All good in theory! But something I didn’t consider is how unpredictable something like travel can be with a 13 month old. I’ll get to that in a minute. More than anything, this time away in Vail allowed for some real family time. 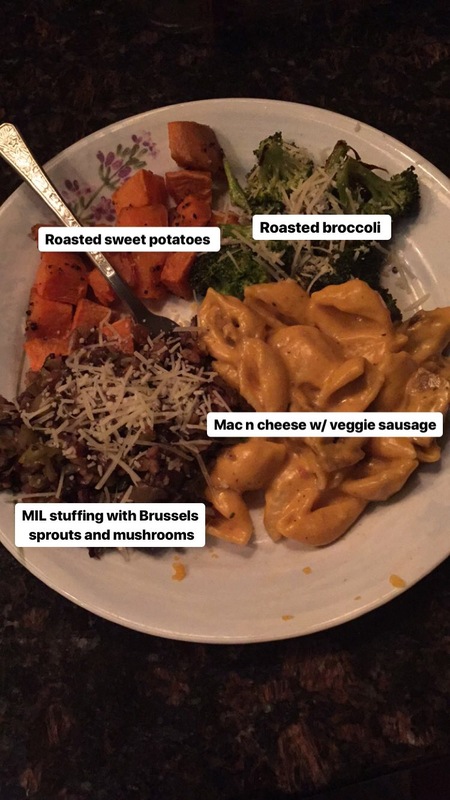 My MIL didn’t have to spend hours in the kitchen, we didn’t have to worry about cleaning, etc. I absolutely loved the quality family time we got. My favorite moments were sitting around the dining room table chatting about random stuff and laughing…a lot! The trip also allowed for us (me, V, and my BIL) to experience and see Vail via a “moderate” hike. While the terrain wasn’t hard to navigate, the elevation factor definitely made us more tired than we anticipated. Holy headaches! Vishnu’s extended family is amazing and so much fun. Even though our time with them was limited, it was great seeing everyone and catching up when possible! It was also super fun to see Kaiden interact with everyone. With the exception of a few people, he was meeting everyone for the first time. One of V’s uncles mentioned making this a yearly thing (a reunion not a wedding! ), so Vishnu’s taking it into his own hands to make it happen. I hope he succeeds because so much love for this family! And last but certainly not least, the wedding! It was all so beautiful. 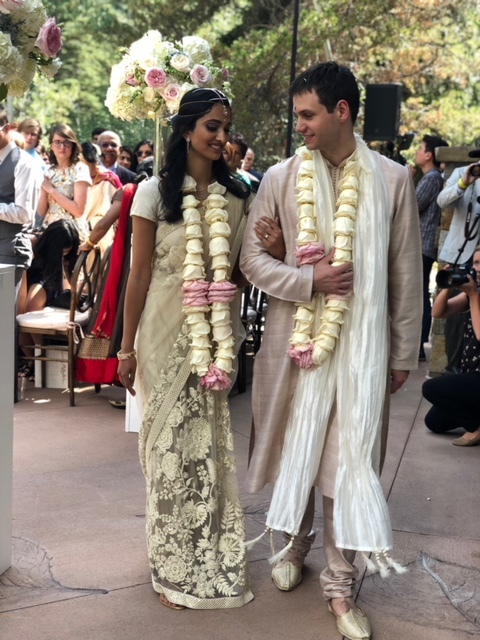 Vishnu’s cousin Tara and her new hubby radiated pure joy. There’s something about witnessing two people who are meant to be take the next step in life! Speaking of the next step, Vishnu gave an awesome speech at the reception about just that. Instead of going down the usual route of telling stories, etc., he shared 10 pieces of advice about marriage and married life. While I didn’t get to see him deliver it in person (I stayed home with K instead of going to the reception), I heard it was awesome and one of the best speeches of the night! In terms of what this trip wasn’t…it wasn’t relaxing! Not that I was expecting much relaxation with K being the most active he’s ever been. However, by the time Wednesday rolled around, K had a fever. And it didn’t go away. To make a long story short, K ended up experiencing his first ER visit (more precautionary because of a high temperature). In the spirit of focusing on the positive, I don’t want to fixate on what didn’t go as expected. Instead, I want to focus on what I learned from our time in Vail. For one, I love my family. Obviously, this isn’t a new feeling, but man did I marry into a great family! Everyone was all hands in with K and ready to give me a break whenever possible. And beyond that, I love seeing K bond with his grandparents and uncle. So many special memories! On a more philosophical level, I learned that in this season of life (maybe all seasons…?) I really just have to go with the flow and take it one moment at a time. If I look at our time in Vail overall, it’s hard to see all the fun we had, but when I break it down day by day, moment by moment, I see nothing but fun. Perspective is everything. And finally, once again, I learned a lesson about gratitude. The grateful life is the best life because regardless of what’s going on when you focus on all the good in your life (and there’s always something) you’ll always be grounded in what truly matters. And now we’re back home and slowly moving into our regular rhythm and flow. Here’s to a healthy and happy week ahead (longer if possible)! My blogging mojo has been off for the past week or so. I have lots I want to share but 0 energy when it comes time to sit down and type. That’s life I suppose! Kaiden’s been a little off the past few weeks, which threw me for a loop. I know I shouldn’t let it, but it’s hard. For example, he’s had a fever every week for the past three weeks. It comes, sometimes stays for a few days, and then goes. One of those fevers led us to discover his first ear infection. Poor bubs! The next one lasted a day. Like I said, he’s been all over the place. The doctor said it’s likely due to daycare. More than anything, I’m thankful it’s nothing serious, but it just throws me off when he has to stay home from school, we go back to multiple wake ups throughout the night, etc. Understandably, everything is either put on hold or straight up ignored until he feels better. Such is life with a baby! Apparently, he’s also in the middle of a LEAP week. When I told Vishnu about this concept and what it means, he said the whole thing doesn’t make sense. I feel like the signs/symptoms match up to a tee, so I’m on team LEAP! In the midst of fever land, we spent some time with family this past week. My aunt (mom’s youngest sister), uncle, and cousin visited from Arizona and stayed with us Wednesday through Saturday. 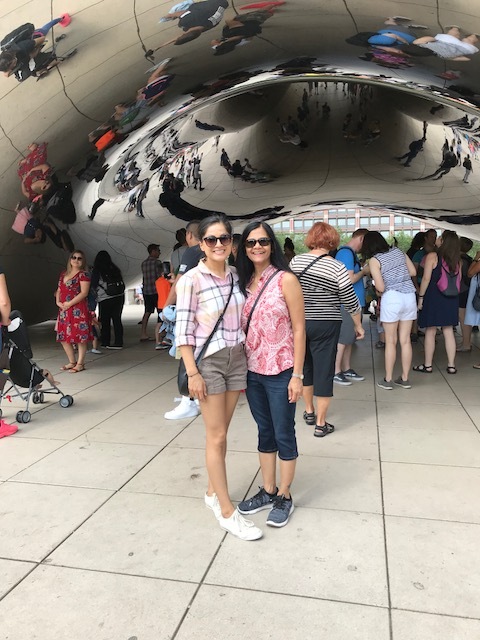 This was their first time in Chicago, and they LOVED it. Because Vishnu and I had to work Wednesday and Thursday, they went out and explored on their own. 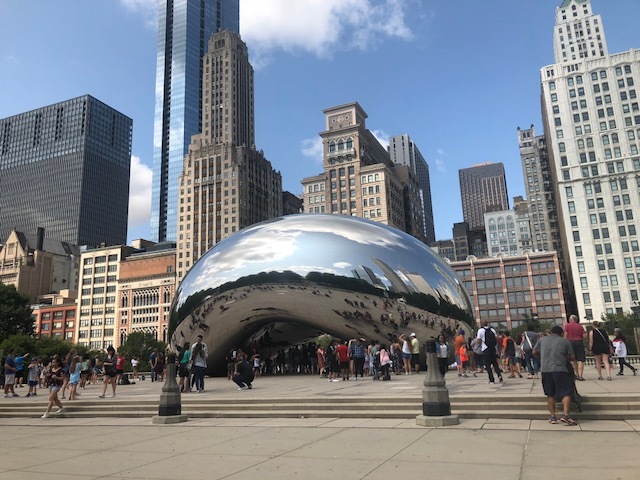 On Friday, we walked to Millennium Park, the Bean, and Grant Park. 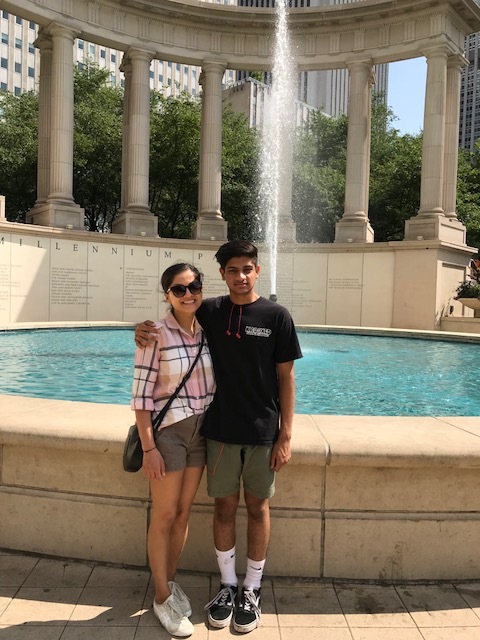 We also made our way to Lincoln Park to see my sister and Adarsh. We ended our night with a fun little quiet (sleeping baby!) game night at our place. So much fun! I wish all my favorite people lived in a 1/2 mile radius from me and not hundreds, if not thousands, of miles from me. Wouldn’t that be nice?! Other than that, we’re gearing up for our week long trip to Vail. We leave next Monday! Vishnu’s cousin’s getting married, and we’re so excited for the family reunion. I’m hoping Kaiden’s sociable side makes an appearance versus his ‘I’m going to cling to my mom for dear life’ side. And finally, is anyone else in denial about summer coming to an end in like a month? Chicago starts to cool down in September, so we really only have a month or so left of warm/hot summer temps. I’m hoping we get a bit of an extension this year (FINGERS CROSSED!). And with that, I hope you have a wonderful start to your week! 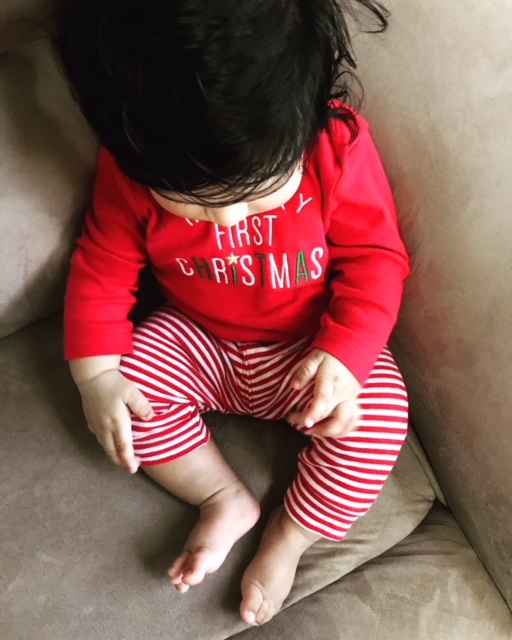 Baby’s first Christmas was super fun…and a little scary! As far as celebrating Christmas goes, we don’t do so in a religious sense, but culturally, we are all in! I’m sure Kaiden was a little confused by all of his boisterous and giddy family members opening presents and yelling over one another! Because my sister and Adarsh flew out on Monday, we decided to celebrate the holiday a day early on Christmas Eve. My MIL and BIL drove over to my parents’ house in the early afternoon and spent the day with my parents, my sister and BIL, Kaiden, and me. My FIL ended up having bronchitis and was unable to join us. A TOTAL and COMPLETE bummer. We started the fun by opening presents. My BIL was our designated Santa, and at first we went person by person, gift by gift, but then we had to restrategize because K looked sleepy. 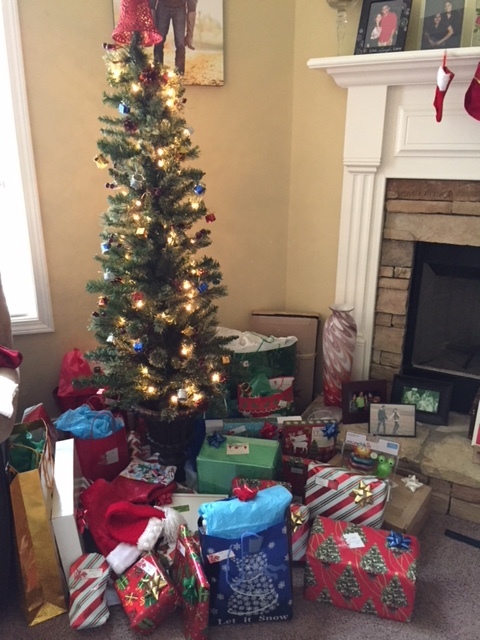 We handed out everyone’s presents and opened them all at once to save time. To ensure we included EVERYONE, we FaceTimed my FIL and Vishnu. Chaotic and fun all at once! For dinner, I made Green and Panang Curry. Totally forgot to snap a picture, but they both turned out great (in my humble opinion…ha!). We ended the meal with my MIL’s banana, pecan, chocolate pie. Yum! As part of our plan to transition K to formula, we’re essentially phasing out my breast milk and adding in formula until he’s 100% on formula. Well, Christmas Eve just so happened to be the day he had his first bottle of formula, and let’s just say it didn’t agree with him. When Kaiden woke up around midnight, I went in to check on him. After changing his diaper, I lifted him up, and he immediately threw up a ton of milk. My sister, who was in the room with me, called out to my mom, and the three of us ran Kaiden to the bathroom. After giving him a quick bath, we got him ready for bed when he threw up a ton of milk again. After another bath, we tried to put him back down, but he still looked sick, so I held him while my sister kept an eye on him. Thank goodness because he threw up one final time (but a much smaller amount this time around). 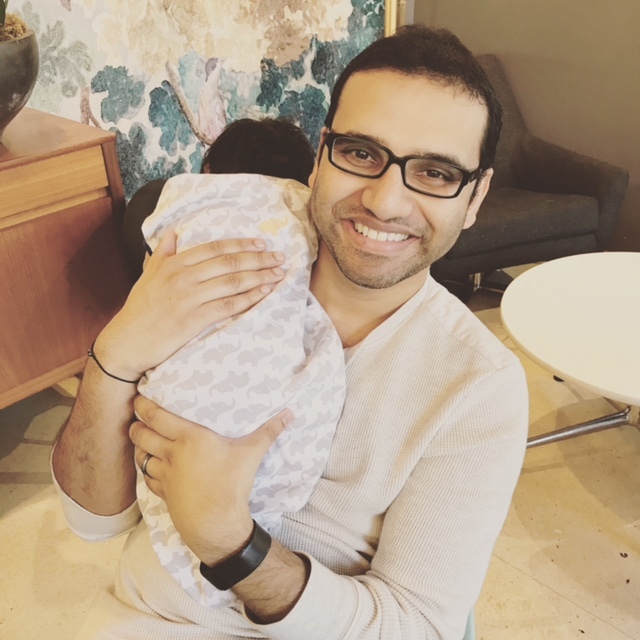 I called the pediatrician, more so for my own peace of mind, and his recommendation of easing into the formula wasn’t much different from my sister’s (a pediatric resident). Kaiden finally fell asleep (and stayed asleep) around 2 am. My sister slept in the room with us just in case something happened. Thankfully nothing did. I have never been so scared in my entire life! I know this is just the start of experiences like this one, but man…I will never forget the sight of all that milk pouring out of his mouth. Kaiden’s doing great (fingers crossed!) now that we’re gradually phasing in the formula two ounces at a time. As for me, my plan to wean off the pump is on hold for now…anything for my baby boy. I’ll ease back into that when we’re in Chicago next week. Other than that, I’m battling a pretty intense cold right now – sore throat and all. 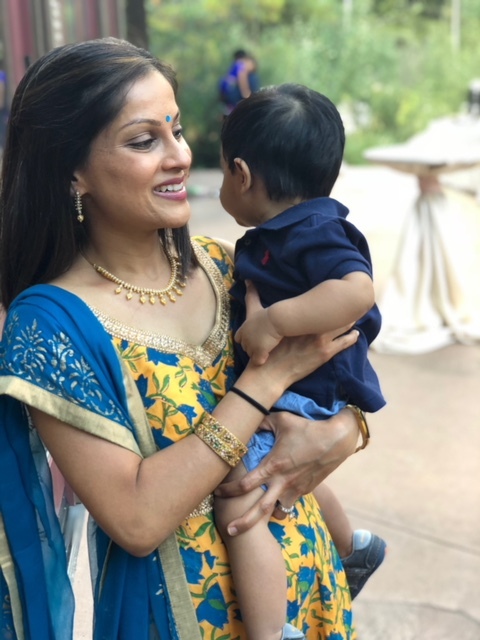 Also, Kaiden and I are staying at Vishnu’s parents until Sunday (when my MIL, Kaiden, and I fly back to Chicago) and are looking forward to spending quality time with this side of the fam! Well, from my family to yours, I hope each and every one of you enjoyed a fun and memorable Christmas holiday! I definitely didn’t intend to take a week long blogging break. But after a doozy of a week, something had to give! More on that in a minute. 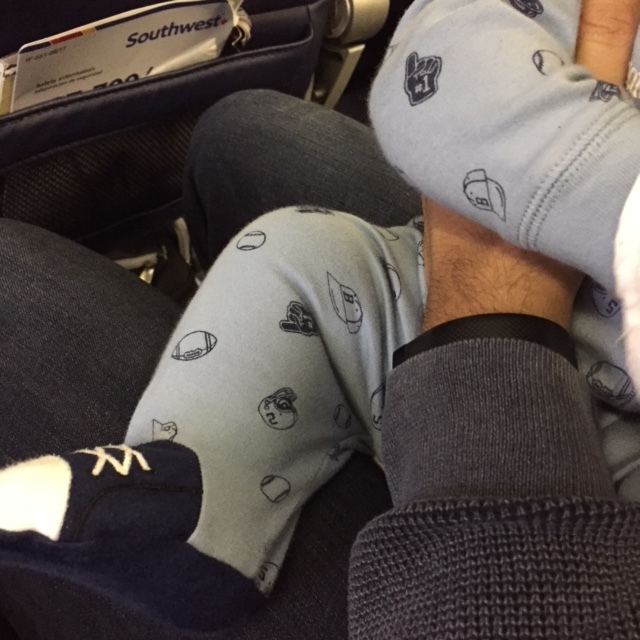 Vishnu, Kaiden, and I flew to Nashville last Friday for a 48 hour whirlwind of a trip. 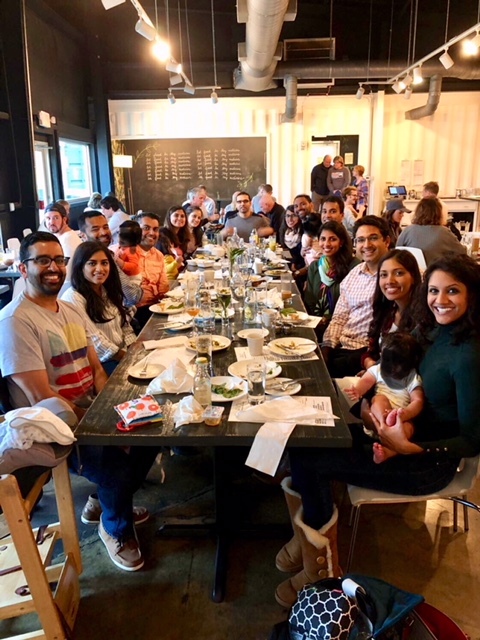 A group of our friends planned a get together, and because Vishnu won’t get to go home (Atlanta) this year, we decided to join the fun. We also wanted Kaiden to meet everyone! 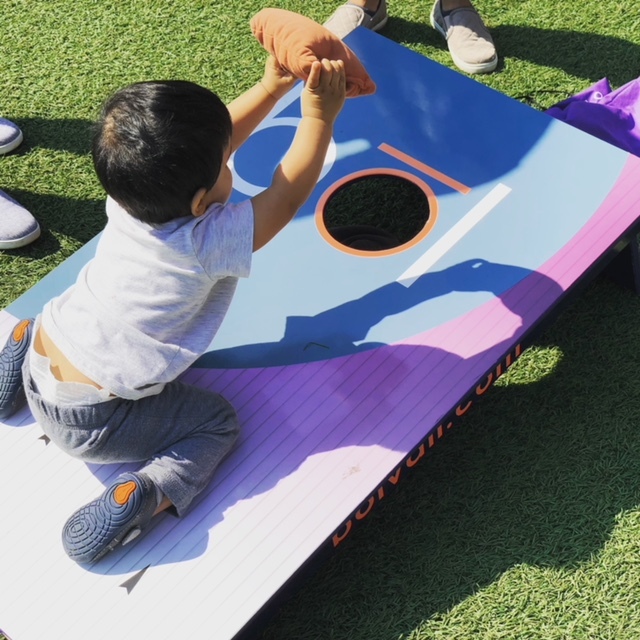 All 14 adults + 4 babies stayed in one big house and made the most of our time together – went out to eat, played lots of games, and laughed/talked nonstop! I shared Kacy’s Nashville recap post with the group, which led to us trying both Avo and Chauhan Ale & Masala House. I highly recommend these restaurants, especially CA&MH. 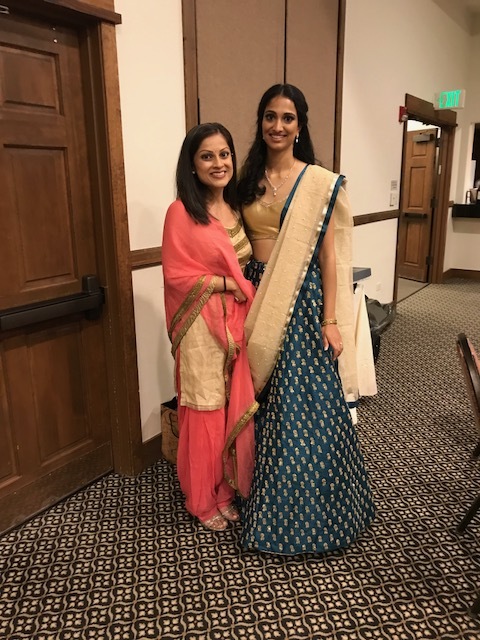 The unique twist on Southern + Indian cuisine was a huge hit with everyone! Thanks, Kacy! All in all, it was a great trip. Kaiden did really well on the flight over and pretty well on the fight back (ha!). I plan to share more about our first experience flying with K because we learned a lot of lessons and have a few stories to tell! While in Nashville, Kaiden was not his usually happy self. He was generally fine during the day, but when it came to his nighttime sleeping, he’d wake up several times in a row screaming his head off. We attributed this to being in a new environment with new people and figured he’d return to his normal self a few days after being back home. Ummmm…not the case! This past week was rough for all of us, especially K. His entire sense of being was off. Not only was he fussier, but he was also clingier than he’s ever been. Wanting to be constantly held is not usually his thing, but man, the minute I’d try to put him down, the screaming would start. He’d literally be fast asleep in my arms (or Vishnu’s), but the minute we’d even attempt to put him down, he’d wake up and start crying. Not only that, but his naps were pretty much nonexistent and his feeding schedule was all over the place. We now think/know he’s teething. He’s showing all the classic symptoms, specifically putting his hands in his mouth and gnawing on them all day long. Poor baby! Thankfully, he hasn’t spiked a fever. We’re also very thankful he still sleeps through the night (knocking on all the wood I can find!). To top it all off, I’ve also been feeling under the weather this past week. I’m not sure if it’s just exhaustion or if I have a cold or something. Hopefully it all passes very very soon! With Kaiden not feeling his best, it was SO nice having extra pairs of hands around for a few days over the Thanksgiving holiday. 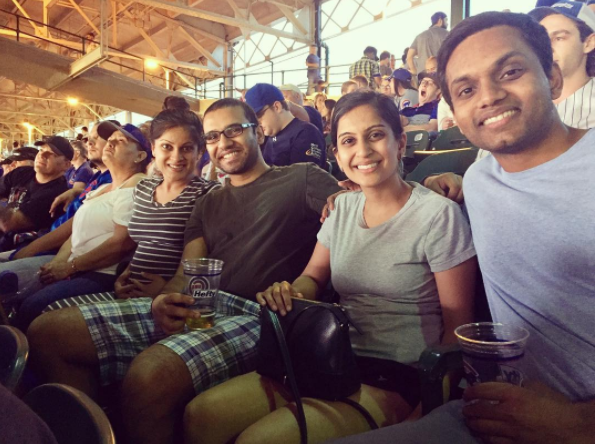 Vishnu’s brother Niel flew in on Wednesday night, and his parents flew in on Thursday afternoon. I’m so thankful for their visit because not only did it inject some fun into Thanksgiving 2017, but it also kept me from going crazy! Thankfully, Kaiden doesn’t discriminate when it comes to who’s holding him. He just wants to be held! And his grandparents and uncle kindly obliged. My in-laws’ visit made me super excited about our trip home in December. I can’t wait for Kaiden to spend some time in the A! After a crazy week, I’m hoping the upcoming one is as routine/normal/boring as they come! Happy Monday…make it a good one. Friday kicked off ‘grandparents week’ for Kaiden. Vishnu’s parents visited us this weekend (they left yesterday), and my dad flies in on Tuesday for a few days. Before I share more about our weekend, I have to say there’s nothing like grandparent love. I speak from experience, as I’m very close to my grandparents and have been ever since I was a little girl. Seeing Kaiden start on that same journey with all four of his grandparents is pretty amazing. And it’s even more amazing to see the joy and love in their eyes when they’re with him whether it’s during face-to-face interactions or FaceTime (gotta love technology!). On to our weekend. Overall, it was pretty low key. Vishnu’s parents didn’t arrive until almost midnight on Friday, and Kaiden was asleep at that time. Saturday started with some hungry cries, lots of milk, and Kaiden snuggles all around…well as much as he would allow! 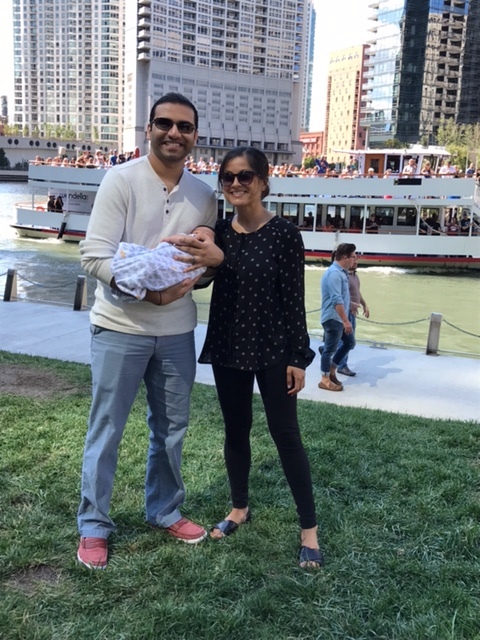 Once we were ready to take on the day, we walked to the Shivalaya temple and then over to the Chicago Riverwalk. 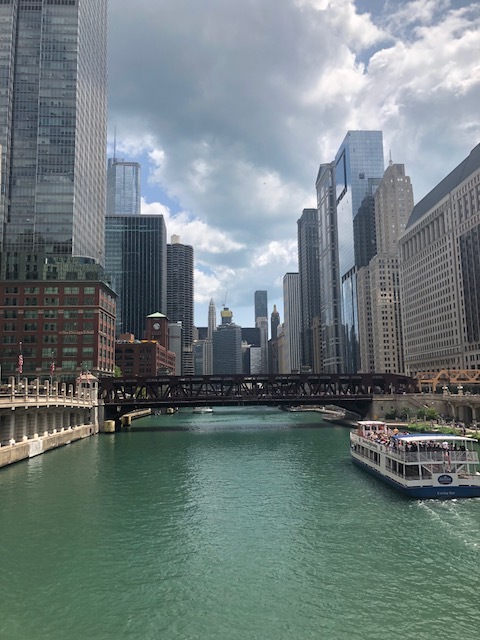 On our way to lunch, we realized Kaiden had a super dirty diaper, so the five us looked at each other and made the executive decision to change him in a somewhat discreet part of Wacker Drive (on a busy day!). Parenthood…the forever adventure! Later in the evening, Vishnu’s parents treated us to dinner at Mercadito. It was nice to catch-up with them sans any disruptions, especially because our only conversations with them these days involve Facetime and Kaiden…no more Par and Vishnu! Although, halfway through the meal, I told Vishnu I missed Kaiden. And just like that…actually, not just like that…Saturday night felt like it went on forever…ha! Anyways, ‘just like that’ it was Sunday morning and time for my in-laws to head back to Atlanta. I really think Kaiden felt the lack of energy (my mom went to her friend’s house for a prayer event) because he seemed a little off. It’ll be interesting to see how he does when my mom leaves. You still have your mama and daddy, little guy! Well hello there! While I can’t say that my blogging break was unintentional, I missed this space and am glad to be back! It’s been quite a week for sure. We moved (! 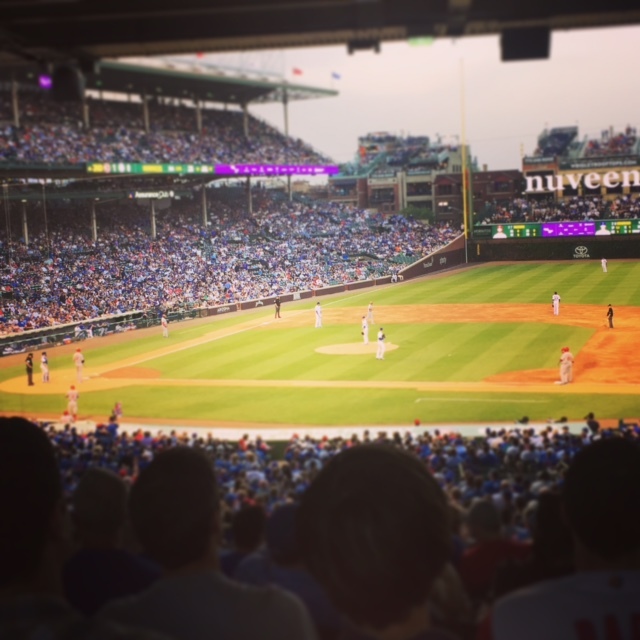 ), we went to a Cubs game, and we attended a newborn CPR class. That’s just the stuff we did. Then there’s all the stuff that happened. Let me tell you allll about it! The biggest thing…WE MOVED! And it’s done and over with <– the BEST part! I will say that it was the easiest move we’ve experienced (and we’ve experienced four in the last five years), as all we had to do was take our stuff about 30-40 feet across the hall. Thank goodness for awesome friends who willingly gave up their Saturday morning/afternoon to help us out! While the move was logistically easy, it was not so easy on this almost 33 week preggo body. My body ached like its never ached before! In fact, I took two 2.5 hour naps on both Saturday and Sunday. Like I said, thankfully it’s done and over with! Now, it’s time to nest and really prepare for our baby boy! Vishnu and I also attended a newborn/child CPR class last week. While Vishnu’s already certified in all of this stuff, I definitely learned a lot of useful information. I just pray we never have to use it. My feet/ankles were super swollen on Friday. Like the biggest I’ve seen them! Naturally, I grabbed a pair of compression socks to help with the issue. 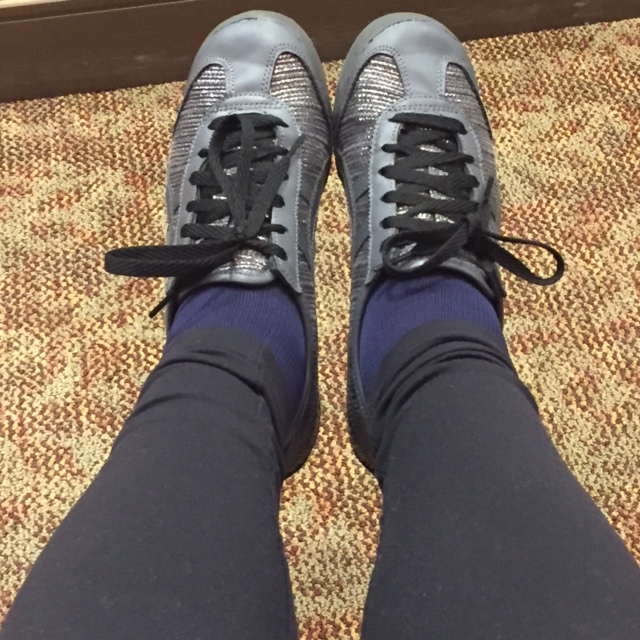 I thought I grabbed a black pair, as I was wearing black leggings. But nope. I definitely grabbed and wore a navy pair that totally clashed with my OOTD (outfit of the day). I wouldn’t have minded at all except for the fact that I had a doctor’s appointment, and of course, that’s where I realized my mistake. My excuse (for everything) –> #impregnant. I inadvertently ended up scaring the AT&T technician that came by on Wednesday to set everything up for us. I made my way over to the new apartment a little before when he was expected to arrive. When I walked into the unit, I saw that our bedroom door was closed and literally shaking. I freaked out, grabbed my keys, and ran out, ultimately running into technician as I opened the door. Of course, I screamed…which made him scream. HOT MESS EXPRESS I tell you! I apologized for my crazy, told him I thought someone/thing was in my bedroom, and asked if he would take a look. Bless this man because he did exactly what I asked and even checked our closets and bathroom for me…you know, just in case! #impregnant…? No, I’m just Par! I’m pretty sure I’m forgetting a pretty funny [to me] Vishnu story! 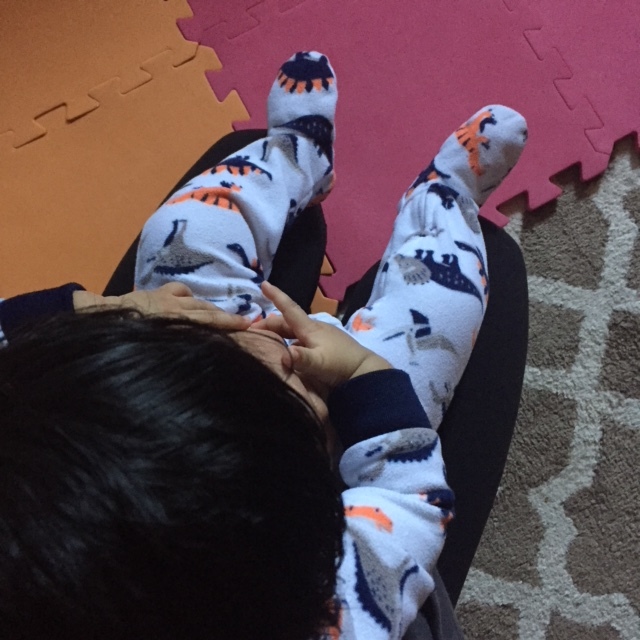 We had quite a few moments this past week that ranged from “aww I love you” to “aww I can’t help but roll my eyes.” Moving stress, and in general the third trimester (for both the mom and dad-to-be), will do that to you!